Day-to-day life at Foster Swift is different from that at most firms. New associates join the practice areas that align with their interests and aptitudes. Associates receive assignments directly from partners and senior associates. All associates get the freedom to discover the practice areas in which they may want to develop a practice. New associates are also encouraged to assume individual responsibility for files and to work on matters of varying sizes and complexity early in their careers. Client contact, court appearances, depositions and decision-making responsibilities are not unusual in an associate's first year of practice. We assist in a young lawyer's development in other ways. For example, the firm encourages associates to select, at the firm's expense, continuing legal education programs and bar and association memberships that will develop specific skills or areas of knowledge the associate considers important to his or her own practice. Identify and discuss concerns relevant to associates at Foster Swift. Offer suggestions to the Executive Committee on addressing associates' concerns. Enhance communication between associates and shareholders. Organize and coordinate the activities of the annual Associate Advance. The Associate Committee was formed in order to provide a forum to enhance communication and camaraderie among associate attorneys. 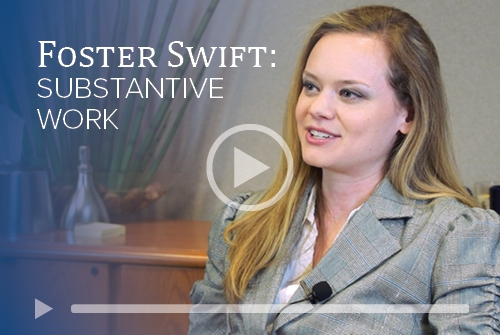 Watch attorney Leslie Dickinson share her experience on how the Foster Swift summer associate program focuses on substantive work.